Founded in 1983 and established online in 1996, Intertops sportsbook is definitely no novice in the gaming industry. Intertops is owned by ThinkQuick Ltd, a St, Kitts and Nevis registered company operating under the license issued to them by Kahnawake Gaming Commission. It is one of the best and most reliable sportsbook online and over the years, they have amassed a large loyal fan base. They are prominent for their two-in-one casino all hosted on one website. Besides the sportsbook and casino, they have a poker room. So how did this bookmaker manage to grow to be at par as to some of leading brands? The sportsbook has been the online bookie main attraction ever since it was established and to be honest, they have taken a quantum step to maintain the status quo. The website of the casino is elegant in black, grey, and shades of red and gold. At the top left of the website is a search button that players can use to browse for games. Just below it, it is a section where player choose the type of sports games they want to wager. At the top right of the website is where you will find the sign up and log in. In the middle section of the website you will find the list of matches that are almost to kick off. 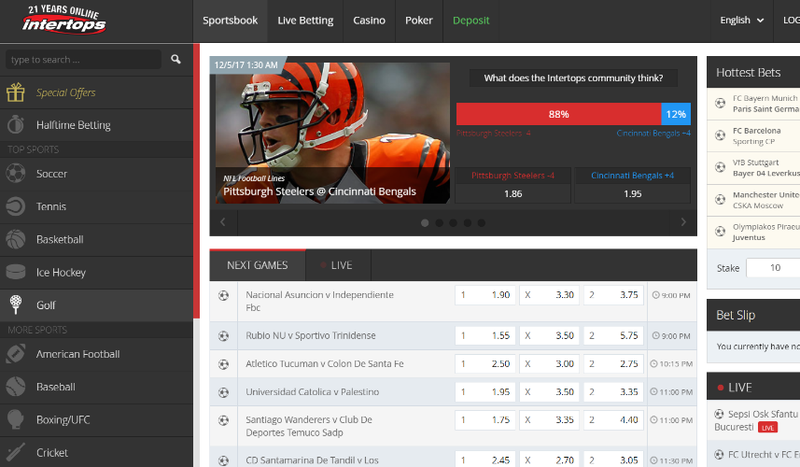 At the bottom of the page are subsections like the Terms and Conditions, contact us button, and live bet history. Everything is easy to find and overall, the website has great navigation. Intertops has a diverse sportsbook that feature games like Baseball, Tennis, Golf, Soccer, Politics, Stock Market, Tennis, Ice Hockey and more. The only sports that seem to be missing are eSports and this is quite disappointing as eSports have so many fans. Other than that, they have parlays, straight bets, prop bets, if-wins, teasers and more. Betting options are aplenty, that’s for sure. The Sports section also features live betting that covers soccer, tennis and baseball matches, etc. However, you will not find live streaming at Intertops, at least not where you actually get to watch the match. Other than that, they offer live play-by-play so, there is that. Their betting limit is $1 and one player has a maximum of winnings that amount to $100,000. Players have the option of betting American, Fractional or Decimal odds and there is an option of pre-selecting a “default stake”. Overall, the sportsbook is nice, although it would be nicer if they offered live streaming. Most bettors will be content with Intertops sportsbook bonus codes. It’s surprising that the sportsbook features a maximum limit towards the rollover, although there is nothing really wrong with it. You need to ensure that you use the Intertops bonus codes to make the claims as well. $20 Free Sign Up Bet- Once you make your initial bet of $20 and send the casino an email with the subject “$20 Sigh Up Free Bet”, you will get a token of $20 credited to your account. 4x $100 NFL Free Bets- When you bet on the NFL regular season, you will have a chance to pocket $400. Weekly NFL Pool- Each week during the regular season, you could win bet tokens of up to $100. Odds Hunter-A player who places the highest winning parlay that has the highest total odds stands a chance to win a $500 gift without any rollover. Parlay Free Bets- When you place parlay bets, you stand a chance to win one of $50 free bets the casino gives out every week. $1k Monthly Parlay Prince- The player that makes the highest profit from one single parlay bet each calendar month stands a chance to win $1,000 bonus with no rollover. Refer-a-friend bonus- If you refer your friends to Intertops Casino, you will get a bonus of 50% of their initial deposit without any limit on how many friends you can refer. Intertops has both an android and an iOS app which players can take advantage and start betting on sport games from their phones. The two apps are free to download on the app store. The app works on ordinary smartphones and doesn’t need any extra configuration for them to work. Alternatively players can play sport games from their mobile phones directly from their mobile browser. Though slower compared to the app, the mobile version of Intertops sportsbook has similar characteristics to the desktop version. Overall Intertops is accessibility on mobile is fantastic. Intertops payment options are diverse and they support players who have different banking preferences. Players have the option for e-wallets such as skrill, Neteller, Money global, Paysafe. Players who prefer extra anonymity can go for cryptocurrencies such as Litecoin, bitcoin and bitcoin cash. Players who prefer debit or credit card payments have the option for the visa, American Express, and MasterCard. Unless otherwise, withdrawals will be processed using the same means as that was used during deposit. Withdrawal processing is done between Monday and Friday and actual transaction processing takes place after 48 hours request. To comply with anti-money laundering practices, Intertops casino instils a mandatory Know your customer(KYC) request where players are requested to send verification documents during the first withdrawal. However, for subsequent withdrawal requests, you will not be required to send any documents. All payment transactions are free from any charges. Unlike debit and credit cards which incurs bank commissions, payment options that involve cryptocurrencies and e-wallets are entirely free. Players are encouraged to have a turnover of at least once to avoid a penalty of 10% of the money that is withdrawn before wagering. Intertops takes serious credibility and as a result it has taken all the positive steps to make sure its business is regulated. They have a license from Kahnawake Gaming Commission which they have maintained with no penalties for breach of conduct. At the same time, they have championed for customer safety through its deployment of cutting-edge IT technology such as firewall. It uses a secure connection as displayed by the green padlock like icon just before the URL bar. The secure connection uses 128-bit keys and ensures data safeguard between the browser and the web server. Well that tells you that any cyber-attack threat is next to impossible. How possible is it to run such a top online sportsbook without a steady team of experienced customer service personnel? Intertops casino runs a team of competent and professional customer service representatives who work round the clock on a 24/7 basis to provide players with instant solutions to their queries. There are various means you can reach the customer service; live chat, skype call, mail support, and toll-free telephone support. You can also head to the help section of the website where you will get detailed information on topics such as general information, betting options and bet offers. For mail and telephone support you can use the following personalized address and contact to reach the specific desk that handles a particular query. The Intertops sportsbook is pretty great. The bonuses are impressive, the payment options are diverse, the customer service is reliable, and much more. Its business operations are licensed and have been in business long enough to gain the trust of so many loyal players, which says enough about its credibility. Just a tip before you sign up, check out for running promotions you might land a deal that will save you money. Intertops sportsbook has exceeded the expectations of lots of players with its sportsbook which by all means deserves recognition for its superb offing. Website owners have the opportunity to make money through Intertops affiliate program. Overall, this is a bookie where novices and seasoned player will find it worth spending their time and money on.